There are many definitions of courage ranging from Ernest Hemingway’s famous quote, “Courage is grace under pressure” to awarding medals to soldiers for bravery under fire. That’s why we were inspired to share the story of Bobby McMullen from Northern California, a 50 year-old man who lost his eyesight to diabetes and yet is a lifelong athlete and a competitive mountain biker. He’s also overcome cancer, clogged arteries and two separate kidney and pancreas transplants. While he usually comes in last or near the rear of the pack in the races he competes in against sighted athletes, the fact that he even participates attests to his willingness to brave whatever challenges the road presents him. Clearly his motivation is not just about crossing the finish line first, it’s about staying in the game. “I think it’s important to have a passion for something, to believe in yourself,” he says. 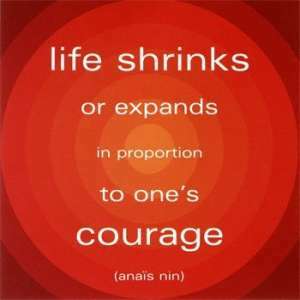 The courage we witness everyday at Novell and Novell is more tangible in everyday lives but no less profound. Everyday courage is taking responsibility for our actions; it’s daring to speak up and sharing our concerns; it’s being able to say no; it’s the courage to let go and to be a leader when no one else will; it’s being tired and yet getting up to go to work after staying up most of the night to take care of a sick family member; it’s volunteering at a community event even though you’ve had precious little “me time” in an insanely busy week and thousands of demands from work, family and society, and twists and turns that we sometimes feel we have no control over. And that’s why when clients enter our doors seeking assistance to address issues and problems that hamper the quality and fabric of their lives, that to us is a courageous act.